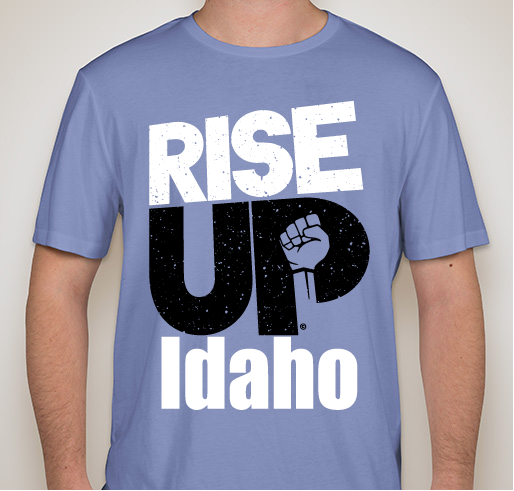 Buy a T-Shirt and Support RiseUp, Idaho! All funds raised will go directly to United Vision for Idaho Inc . 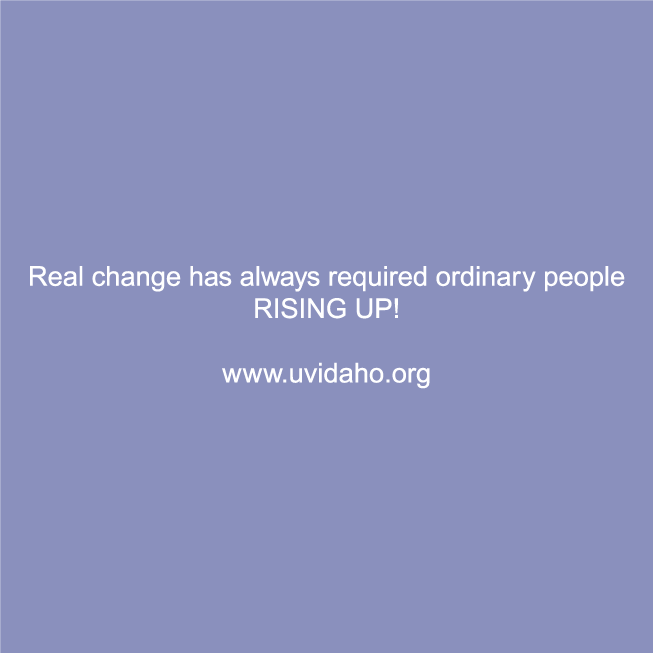 In the fall of 2016, United Vision for Idaho launched RiseUp, Idaho! which is now part of a 13-state rural populous organizing initiative of People's Action. We advocate a bold agenda, not a list of policies the establishment says we can win, but what the people of Idaho must win. The majority of Idahoans don’t believe their issues or values are being represented by either party - believe that special interests have superseded individual rights and opportunity - believe that we have lost our ability to have respectful and meaningful conversations to create real solutions. From cities to family farms, this effort consists of Idahoans united on issues and values, committed to bridging, building and igniting communities to advocate for policies that lead to real improvements in people’s lives. What makes this different from other organizing efforts?  This is the most robust rural organizing project in ours and twelve other states across America.  Through powerful partnerships, we are cultivating national reinvestment in Idaho to increase support, resources, opportunities for the long-term.  In four key regions of the state, we will reach 136,776 of the 291,677 unaffiliated, registered voters that constitute more than half of the voting public.  We are focused on getting the representation we deserve, and passing Medicaid Expansion, but this is not just about one campaign, or one election cycle, this is about bridging communities and building people power for generations to come.  With affiliates in each area of the state, connections will be used to build infrastructure at the local level by providing contacts, ongoing support, training, and statewide and national connection to build real statewide power. 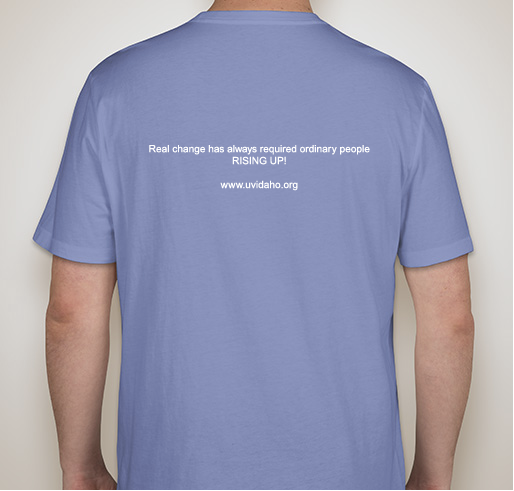 RiseUp, Idaho is nonpartisan and unaffiliated with any political party. We advocate a bold agenda, not a list of policies the establishment says we can win, but what the people of Idaho must win. The majority of Idahoans don’t believe their issues or values are being represented by either party - believe that special interests have superseded individual rights and opportunity - believe that we have lost our ability to have respectful and meaningful conversations to create real solutions. From cities to family farms, we are Idahoans committed to revisioning and remaking our democracy, holding elected leaders and those seeking public office accountable, and working together to make real improvements in people’s lives. We are Idahoans united in our values and committed to bridging, building and igniting communities to advocate for policies that lead to real improvements in people’s lives. This is the best organizing effort I have seen in decades! 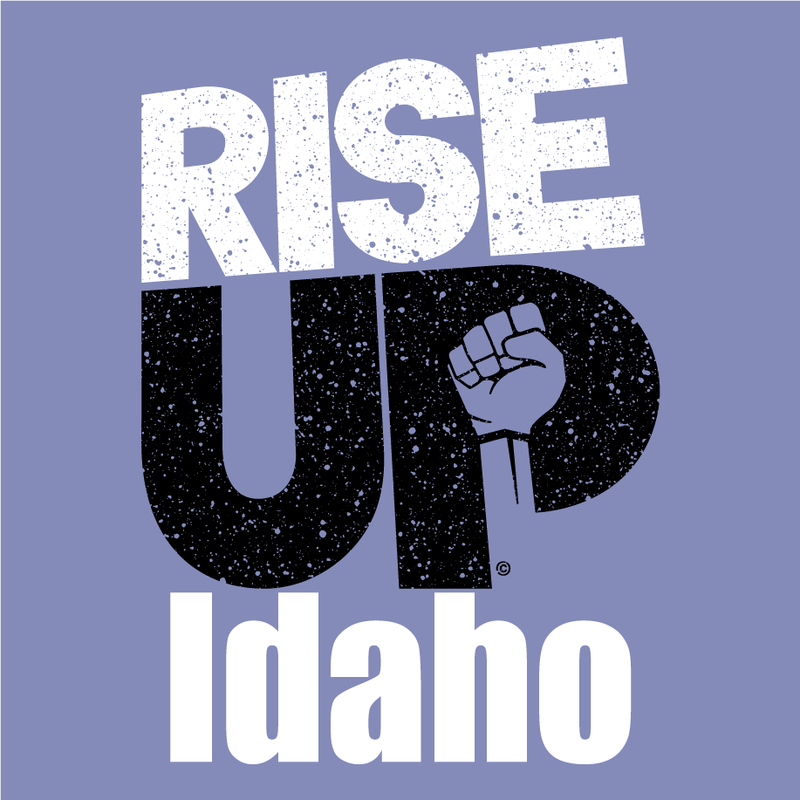 Share Why You Support "RISEUp, Idaho"